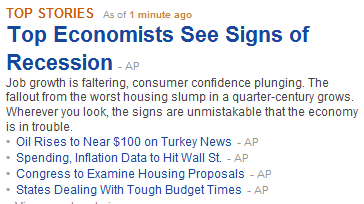 The word Recession is going around infecting people like the Flu has been lately. I've felt sick for over 3 weeks it seems like now. There's numerous economic reports out this week which are surely to create some volatile moves in the market. Volatility normally means downside action. Although the bulls did some BS rally at the close on Friday, I wouldn't be surprised to see another BS rally up 600pts on the Dow. All it will take is some freak news report to send this market into a crash. And with talk like mine you can be sure the market is going to rally in the bulls favor. How much more bad news can come out that we haven't seen for the last 9 months. Remember Murphy's law, the worst can always happen, whether the market goes up, down, or continues to chop around for months to come. What's with CBOT's quotes? YM is up 26pts right now? This position continues to sink as planned.